The Asturian or Astur-Leonese dynasty (dinastía asturiana or astur-leonesa), known in Arabic as the Beni Alfons or Banu Alfonso ("sons of Alfonso"), was the ruling family of Asturias, Galicia and León from about 740 until 1037. The first king of the dynasty was Alfonso I, son of Duke Peter of Cantabria. 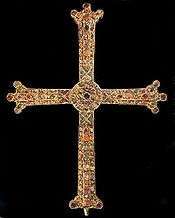 For the first century, rule alternated between Alfonso's descendants and those of his brother, Fruela of Cantabria. With the death of Alfonso II a century later, a younger branch of the family took the throne, headed by Ramiro I. For most of the 10th century, internecine squabbles resulted in divided rule and succession struggles among various branches of the family, which were brought to an end by the succession of Bermudo II in 984. The rule of the dynasty ended with the defeat and death of Bermudo III in 1037, the throne passing via his sister to Ferdinand I of León. Under their rule, the Astur-Leonese kingdom went from a small mountain enclave to one of the dominant powers in Hispania. In 1037, King Ferdinand I of the Jiménez dynasty of Navarre ascended the throne and the rule of the Beni Alfonso came to an end.